Keaton was an American filmmaker celebrated for his work in silent comedy. He spent almost his entire existence as an entertainer, from toddlerhood until death. While Keaton enjoyed popularity during his life, the real genius behind his work may not have been fully appreciated by his contemporaries. Not until a resurgence that began in the 1950s and really took off with the rediscovery of many of his films that were thought to be lost, has a deeper respect for his talent taken hold. The spiral of recognition and acclaim seems to be swelling for modern audiences who can now so easily become acquainted with his work online. Though his style of comedy is properly termed slapstick (that is what he himself called it), it bears little resemblance to the eye-poking, pie throwing antics people have come to associate with that word. His style is uniquely physical, skillful, acrobatic, graceful, self-depreciating, positive, resilient and always full of wonder. As with many people who call themselves human, his personal life and career cycled through periods of challenge, but Buster Keaton almost always retained his genuine sense of contentment and ease. Buster's career began almost at the start of his little life. By the time he was a toddler he had already demonstrated a genius for falling without getting hurt and began to be called "The boy who couldn't be damaged." He was a performer back in the days when words like "Medicine Show" meant something to most people. His family's act, which he joined at the age of 5, hit the big time when the big time meant "vaudeville." He must have logged 10,000 hours of practice and performance by the time he was 8. And he continued to perform in the family act until his father's drinking began to break them up. They were a rough and tumble type of act and through his performances in these years, Buster learned the gamut of classic gags and routines, many of them profoundly visual in nature -- a deep well that he plumbed for laughs many years later. 2) His time with Arbuckle. On one fine, random day in 1917 the world got very lucky. That was the day Keaton walked into Roscoe Arbuckle's New York movie studio to tour the set. When Arbuckle invited him to take a small part in the film he was doing Buster wasn't sure, but when he saw the cameras and the studio set-up, his inner engineer started screaming for joy. He said 'yes'. There was no looking back. Arbuckle saw the talent and put it to work. For the next 3 years, the two friends made about a dozen short films together and Keaton had the chance of a lifetime to learn the movie business from a pro. The movies Keaton made with Arbuckle are physical romps, athletic, somewhat bawdy, usually a bit juvenile and always very funny. After Arbuckle struck out on his own, Keaton went to work for himself. For about 3 years, as director, writer and actor, Keaton churned out an impressive set of short comedies -- 19 in all. These show a growing talent as Buster learns and develops his own style, quite distinct from Fatty's. He tested the waters fearlessly trying a variety of ideas and making deeply satisfying movies that are aesthetically pleasing and funny as hell. The films start to show an interest in the surreal and the ironic - a subtler form of comedy he began to develop. As 1922 drew to a close, Keaton was approached by his financial backers and cut free to start making feature length movies. Although their decision may have been rooted in both the desire to keep up with the Jones and get a better return on their investment, Buster was excited about telling fuller more developed stories. For the next several remarkable and happy years, Keaton expressed his inner creative vision in a dozen feature-length movies that include some of the best movies of all time. His streak in making so many phenomenally great movies one after the other has to be nearly unmatched in Hollywood history. Six of these films (Our Hospitality, Sherlock Jr., The Navigator, Seven Chances, The General and The Cameraman) have an IMDB collective rating of at least an "8". And that list doesn't even include what many consider to be his greatest film: Steamboat Bill Jr. It is a remarkable body of work issued between 1923 and 1928. More remarkable still: there is nary a dud in the bunch. The extraordinary confluence of his talent and ability to control the production gets the credit. His films of this era have an underlying intelligence to their approach; they unfold a story gracefully and gradually with wonderful comedy as well as character development and plot. When I say "crappy," I don't mean Buster was churning out crappy work (though that may be a fair assessment). Rather, this is a crappy time for him, professionally and, for a large part of it, it was horrific time for him personally. People refer to this as "his fall" but that is not the path I want to go. All lives are made up of parts. Complex, brilliant, and interesting people do not stop being so when they go through more challenging times. During this time, Buster didn't become less talented - but he experienced the loss of creative control over his pictures. Buster's studio had closed its doors and he signed a contract with MGM that put his genius in the hands of a more corporate "studio system" model; that decision, coupled with the collapse of his marriage, and concurrently, Hollywood's wholesale shift from visual comedy to sound pictures, resulted in a very difficult path for the time being. Buster continued to work, non-stop, and outwardly appeared to accept his fate with as much grace as possible, though inwardly turning to drink. Turning points were reached in 1935 when Buster got and stayed sober and, an important one in 1940 -- the marriage that finally left him contented. It's hard to pinpoint the beginning of the revival. You might put it at 1940, when he married Eleanor Norris and became a personally happy man. You might put it in Paris, 1947 when he and Eleanor began performing to live audiences that thrilled to his talents once again. Most likely, you'd cite the 1949 article in Life Magazine by James Agee praising his life and work and shining a public spotlight on him once again. Or, you might think to the moment in 1952 when actor James Mason discovered piles of Keaton films in his shed at the mansion that used to be Buster's and the world was once again viewing the work of this great master. However you pin it down, it is gratifying to think that Keaton was able, in his lifetime, to enjoy that sense of full appreciation for his past work and a renewed clamoring for his performances. 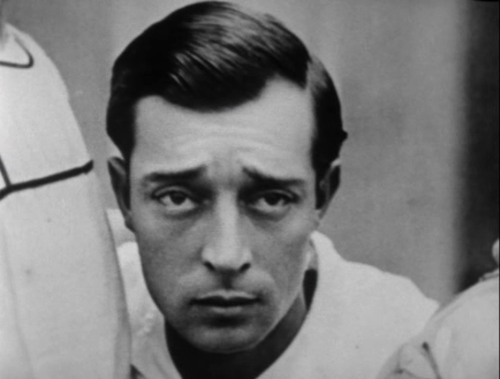 Buster appeared on tv shows, in cameo roles in movies, gave interviews and attended screenings of his silent work to great fanfare. He spent his last decade in the full understanding that his legacy had not been forgotten. Factual material underlying this discussion comes from myriad sources including Keaton's films, interviews with Keaton conducted in 1957 and made available by Columbia University, the documentary film "The Railrodder," a BBC documentary entitled "Silent Clowns" hosted by Paul Merton, a documentary film in three parts entitled "Buster Keaton: A Hard Act to Follow", the biography "Tempest in a Flat Hat" by Edward McPherson, as well as a great many other internet commentators and discussions. I've been a big Keaton fan for a long time. I'm thrilled that you have put so much energy into my favorite silent film star (and maybe my favorite filmmaker, along with Billy Wilder)...I've always had a soft spot for Our Hospitality, with it's amazing ending...any thoughts on that film?